Drive-in and Drive-through (sometimes spelled Drive-thru) are storage rack configurations that allow the forklift to drive directly into the lane of stacked rows (called a bay). 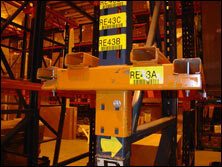 The difference between a drive-in and a drive-thru pallet rack system is simply whether the bays have an entry at only one end, or at both ends. Drive-in rack systems use a common entry and exit, while drive-thru systems have entry points at either end of the bay. Because a drive-in racking system has only one entrance, it uses what is called a “Last In, First Out” (LIFO) storage method. 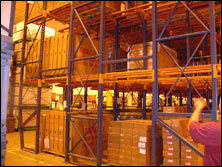 With only one entrance, the last pallet put into a row is necessarily the first one to be taken out. A drive-thru storage system, with two different entry points, can also use a “First-In, First-Out” (FIFO) storage method. 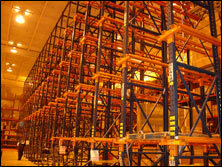 With a FIFO system, pallets are loaded in one end and are pushed back to the other end, where they are then at the front of the row on the opposite side. The first pallet put into such a row is the first one taken out at the other end. This system is advantageous for material with an expiration date or wherever shelf life is a major concern. Used Drive-In Rack in Stock! This system can be modified to meet your requirements. 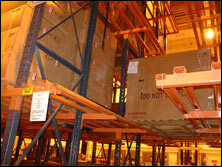 Click to see our inventory of Push-Back Rack.